Dental implants are a great way to replace single or multiple missing teeth. They can provide a fixed and stable solution for patients, rather than having to wear some kind of removable appliance. Utilizing dental implants, a loose and uncomfortable denture can be a thing of the past. For the vast majority of patients, a new implant supported appliance will provide you with the ability to function with great confidence, stability, and comfort. 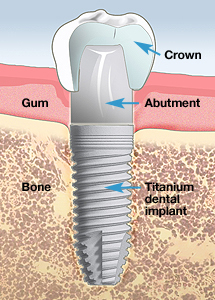 Dental implants are simply described as "artificial roots" that are made from titanium. They are surgically placed into the upper and/or lower jaw bone by a specially trained implant surgeon. The teeth subsequently attached to the implants are very natural looking and will enhance or restore your smile and function! They have been used in dentistry for over 30 years. More recently, however, it has been the past ten years that the increased predictability and success of implants has given millions of patients a very stable and comfortable solution that will very often last them a lifetime. Resolve joint pain or bite problems caused by teeth shifting into missing spaces. Restore your confidence, smile, and function. Advantageous for efficient chewing, speech, taste, and digestion. Can be used as support for a bridge or denture, making them very secure, comfortable, and conservative in size. 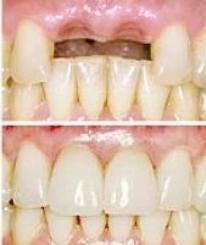 Eliminates the possibility of decay in the area of the implants and their restorations. The process of getting implants can require just a very few visits, or it may require a number of visits over several months. This depends on your particular case, as well as your specific wants and needs. During your initial consultation visit, x-rays and impressions (molds) are taken of your teeth and jaws in order to determine the amount of available bone, gum tissue contours, and spacing available for implants. During the placement appointment, while the area is completely numb, the implant(s) are surgically placed into the bone. For single implants, this usually takes about an hour or so. then usually allowed to heal and attach with the surrounding bone (a process called osseointegration). Depending on your specific case, this healing time may be very minimal or even necessary at all, or it may have to extend for up to six months before the artificial tooth can be attached to the implant in the bone. Once the artificial teeth are made and fitted to the implant(s), they are securely attached, providing excellent stability and comfort. You will receive care instructions when your treatment is completed. Good oral hygiene, including good flossing habits and regular dental visits, will aid in providing you with the best possible long term outcome.